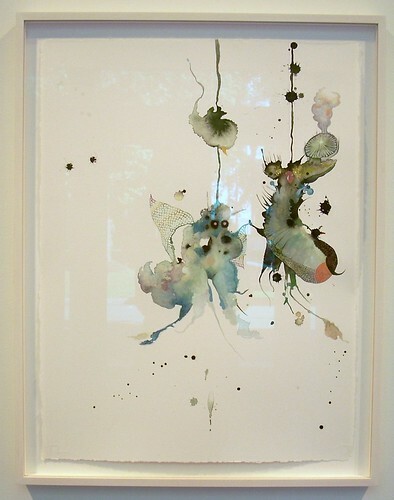 Hayley Barker’s solo exhibition at Charles A. Hartman Fine Art is comprised of 10 to 15 watercolor paintings on paper. 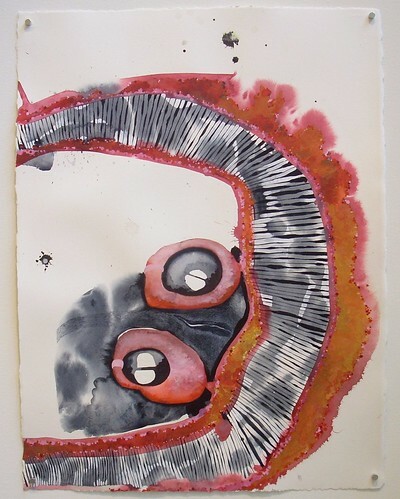 The paintings are layered with detailed markings and tonal washes, and include imagery from plant life, animal fur and scales, and ambiguously sensual organic forms. The show is on display from September 2nd, 2009 through October 10th, 2009. 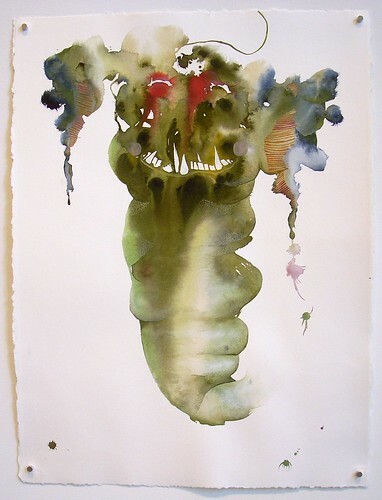 Barker takes ink and watercolor blobs and transforms them into Chimeras of part cartoonish mythical monster, part sensuous organic form, part abstract painting. 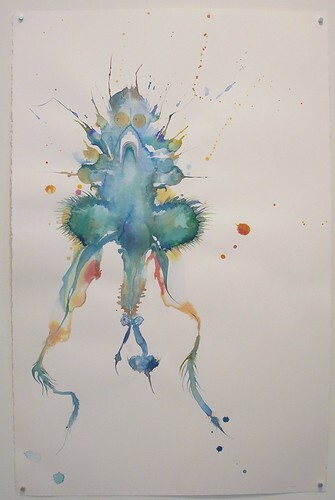 Using bright washes of watercolor as base, Barker manifests her own Rorschach tests into monsters and whimsical lifeforms. Barker interweaves elements of the delicate with the grotesque, plays along the borders between formlessness and hard edge, and transforms elements of her paintings into imagery that is sometimes sexual, sometimes comical. In her artist statement for the show, Barker talks about the vilification of mutated life forms and how we as humans, tend to placed judgment upon these mutations as “bad” when evolution itself depends on mutations to further and ensure life on earth. Barker’s Chimeras pay reverence of those mutations, not as unnatural villains, but as manifestations of the purity, beauty, and humor that is life. Visit Hayley Barker’s website for more examples of her work.